Amartya Sen’s concept of Development As Freedom (1999) is highly acclaimed. He argues that human development is about the expansion of citizens capabilities. For Sen, freedom means increasing citizens access and opportunities to the things they have reason to value. Sen challenges the mainstream concept of measuring development by economic growth (Evans 2002). Sen does acknowledge that increases in poor people’s incomes do contribute to the expansion of their freedoms. However, he recognises that increase of income alone “has at best uneven and at worst has detrimental impacts on the majority of a country’s population, and radical redistributive measures are necessary for the poor to benefit from growth” (Selwyn 2011:69). Sen alerts the reader that poverty, unfulfilled elementary needs, the occurrence of famines, the violation of political freedoms and neglect of the agency of women remain today despite ‘unpredented opulence’ (1999). He makes it clear that previous strategies to reduce these catastrophes are erroneous. His approach focuses on human flourishing as the entry point to the problem of poverty and global inequality rather than economic growth (Reid-Henry 2012). Sen (1999) contends that all human beings are equally entitled to enjoy a life that they value. If pursuing freedom-for-all is about expanding citizens’ capabilities, the focus should not be exclusively on making up for what people lack (Reid-Henry 2012). “Development consists of the removal of various types of unfreedoms that leave people with little choice and little opportunity of exercising their reasoned agency” (Sen 1999:xii). Sen defines the major factors that limit freedom as ‘poverty as well as tyranny, poor economic opportunities as well as systematic social deprivation, neglect of public facilities as well as intolerance or over activity of repressive states” (Sen 1999:1). He argues for the removal of these major factors. Sen focuses on crucial instrumental freedoms: economic opportunities, political freedoms, social facilities, transparency guarantees and protective security. These, he argues, need to be interconnected. Social facilities involve institutions such as the state and the market. Sen asserts societal arrangements should be investigated “in terms of their contribution to enhancing and guaranteeing the substantive freedoms of individuals, seen as active agents of change rather than as passive recipients of dispensed benefits” (Sen 1999:xii). Social facilities should aim to provide opportunities that increase the well-being of the population. Sen’s work (1999) had a huge influence on the establishment of a new paradigm in the early 2000s. Development was “redefined in terms that include human rights as a constitutive part: all worthwhile processes of social change are simultaneously rights-based and economically grounded, and should be conceived of in those terms” (Uvin 2010:168). Sen’s capability approach challenges the world-view of elites. He manages to convince skeptical economists that social choice and public discussion is both possible and necessary. He contends that choices about growth strategies should be democratic (Evans 2012). “Sen has focused on the well-being of those at the bottom of society, not the efficiency of those at the top” (Longworth 1999). He influences the ideas and decisions made by other development actors. The Millennium Development Goals are guided by Sen’s ideas. The United Nations Secretary-General Kofi Annan, spoke about freedom and the rights of the poor in his report named ‘In Larger Freedom’ (2005). “A world of interdependence cannot be safe or just unless people everywhere are freed from want and fear and are able to live in dignity. Today, as never before, the rights of the poor are as fundamental as those of the rich, and a broad understanding of them is as important to the security of the developed world as it is to that of the developing world” (Annan 2005). When discussing the Human Development Index, Paul Streeten concludes “the approach that sees nutrition, education and health as ends in themselves… will argue for projects… that enhance these ends, even when conventionally measured rates of return on these investments turn out to be zero”( Streeten 2009:234) and this approach “leads inevitably to the call for freedom by the people” (Streeten 2009:236). Sen’s capability approach is viewed by most development practitioners as an invaluable analytical and philosophical foundation. However it is argued that this foundation should not just be admired but built upon (Evans 2012). Selwyn argues that Sen’s view of freedom in capitalist markets is myopic as the market is an institutionalized unfreedom. He asserts that Sen complies with Adam Smith’s understanding of the market as an arena of choice and “does not propose radical, distributive, developmental policies and practices” (Selwyn 2011:75). Although Sen’s approach seems radical in many ways, in terms of markets it does not challenge the status quo, overlooking the detrimental exploitative affect that the market can have on the poor. Moreover, as Evans (2012) argues, in the current context market-based power inequalities need to be prevented, Sen overlooks this. By using both Smith and Marx to support his case, Sen’s work has many contradictions. His work on famines is at variance with his liberal conception of the capitalist markets (Selwyn 2011). Uvin (2010) contends that Sen’s ideas on democracy and participation were not new. He quotes a Statement written five years before Sen wrote Development as Freedom. The statement is from the UN Secretary-General’s agenda for development. “Democracy and development are linked in fundamental ways… They are linked because democracy is a fundamental human right, the advancement which is itself an important measure of development. They are linked because people’s participation in the decision making processes which affect their lives is a basic tenet of development” (United Nations 1994, para 120). Uvin argues that we ought to ask why these ideas have not been acted on before, since they have been around along time in the development field. 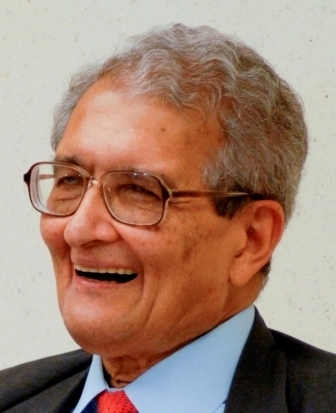 “This is where we encounter the limits of Amartya Sen’s major contribution to development. There is no politically grounded analysis for what stands in the way of his approach” (Uvin 2010:168). “By signing up to Sen’s vision, [agencies] remain committed to little more that improved discourse – in this case in a well-appreciated economic-sounding form” (Uvin 2010:169). Sen had a radical impact on development debates and policy but what is happening in practice? Are development actors questioning their own behaviour? The human-rights objectives “are to be implemented out there, in the Third World. Without the agencies requiring a critical look at oneself” (Uvin 2010:169). Evans, P. 2002. Collective Capabilities, Culture, and Amartya Sen’s Development as Freedom. Studies in Comparative International Development. 37:2. pp 54-60. Selwyn, B. 2013. Capitalism vs. Development. Not yet published. Uvin, P. 2010. From the right to development to the rights-based approach: how human rights entered development. In Cornwall and Eade(eds). Deconstructing Development Discourse. Buzzwords and Fuzzwords. Oxford:Practical Action Publishing Ltd.